"On several occasions, we have reached out to Maria Bonita catering and have been completely satisfied each time! Maria Bonita offers authentic Mexican cuisine with friendly and professional service. We are proud that they represent a growing segment of the Latino population of Omaha---- owned by a hardworking, immigrant family that has set roots in our city, Maria Bonita shares Mexican authenticity wherever it goes." "We love having Maria Bonita cater our events. We appreciate their professionalism and will continue to use their catering services. 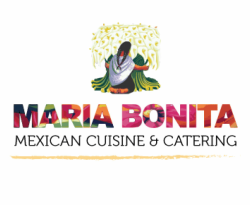 Maria Bonita ensures that our events run smoothly by arriving on time and setting up so that all we have to do is relax and enjoy the delicious food, which is always a hit with our group! Gracias!" Latino Employee Network at Union Pacific. "Just wanted to reach out regarding the 50th Birthday Party. Thank you so much for making it super special, the food was so amazing we froze the leftovers and had Part 2 party after we returned from Mexico. But, I have to tell you, the service was also remarkable. We live at Hanson Lake and EVERYONE gets lost. Food was delivered on time and were so accommodating. We will definitely have another catering opportunity, plus word-of-mouth is powerful and I have told everyone I know how great you were." "I've used Maria Bonita for several catering events and I've been extremely pleased with the delicious food and the outstanding customer service. I would recommend Maria Bonita to anyone for your catering needs. You will not be disappointed!"